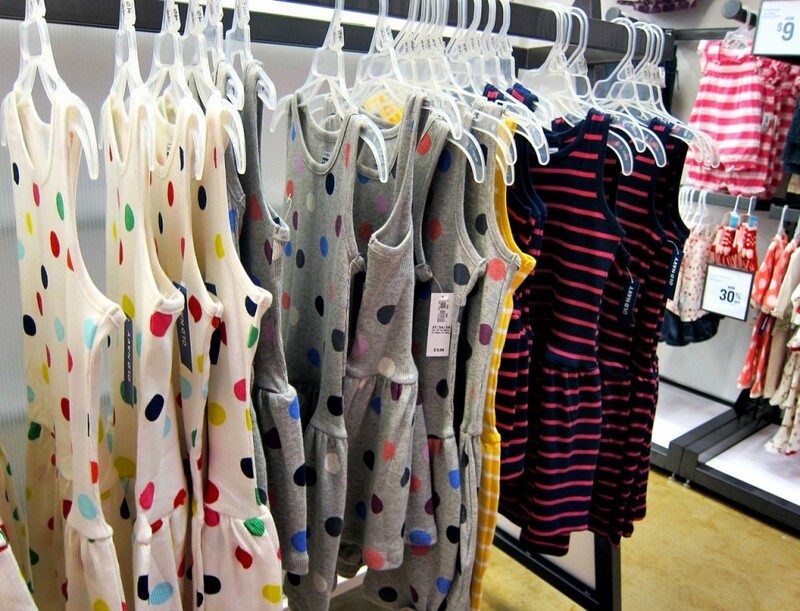 I am obsessed with Old Navy clothes. No joke. In all honesty, it is my favorite clothing store. You can’t beat the prices and quality. I was beyond excited when I was chosen to write this campaign. 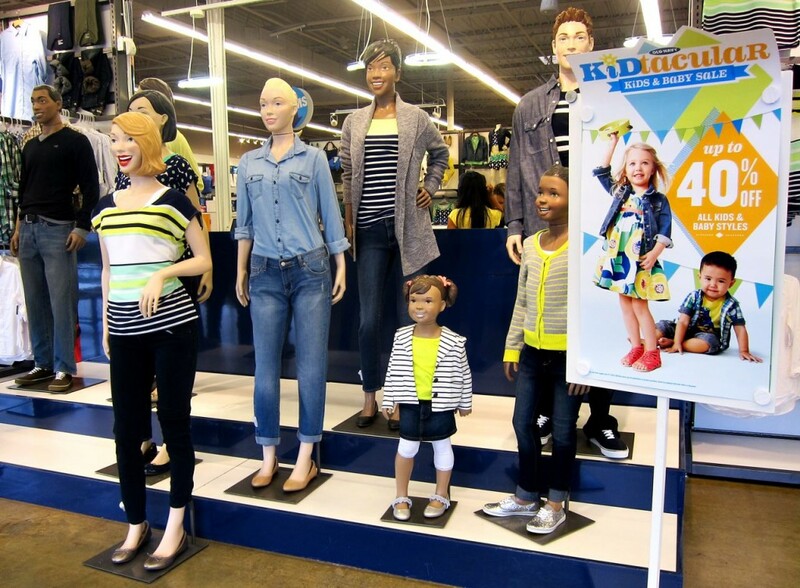 Old Navy’s Kids and Baby Sale is an annual event I tuck in my head. There are so many “basic” pieces we need every season like gym shorts and solid colored shirts that you can not beat paying only $5 each. 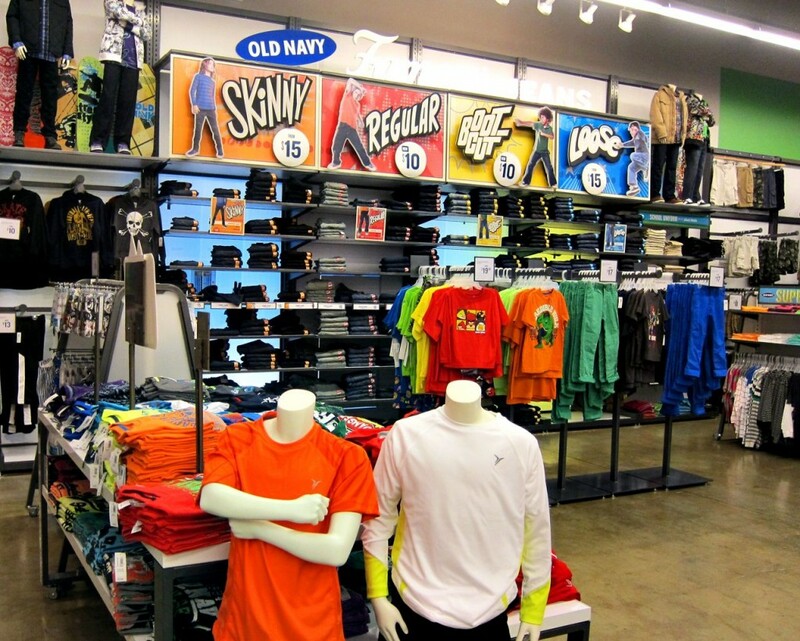 During this sale, even the cute collared shirts, character shirts and jeans are priced almost half of their normal cost. The deals are unreal. 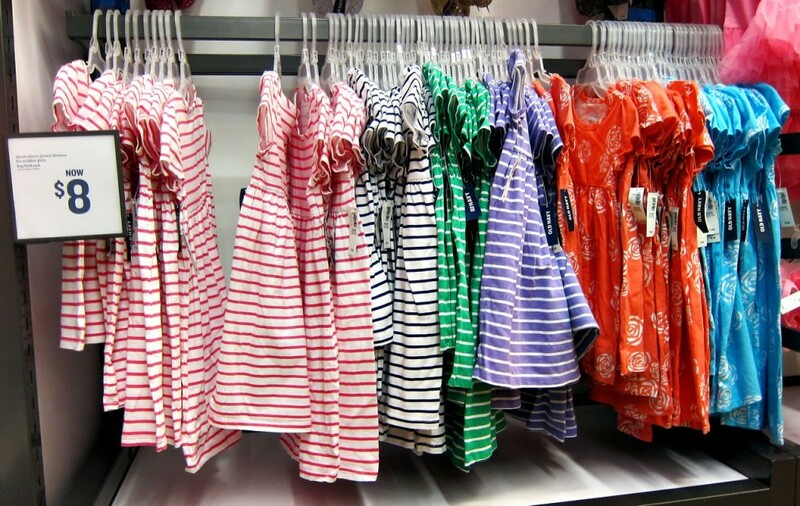 Cute sundresses at $5 and $8 each? Yes, please. I will take one in each color. This annual Kids and Baby Sale is going on right now. He is hilarious, and we had the best time shopping together. 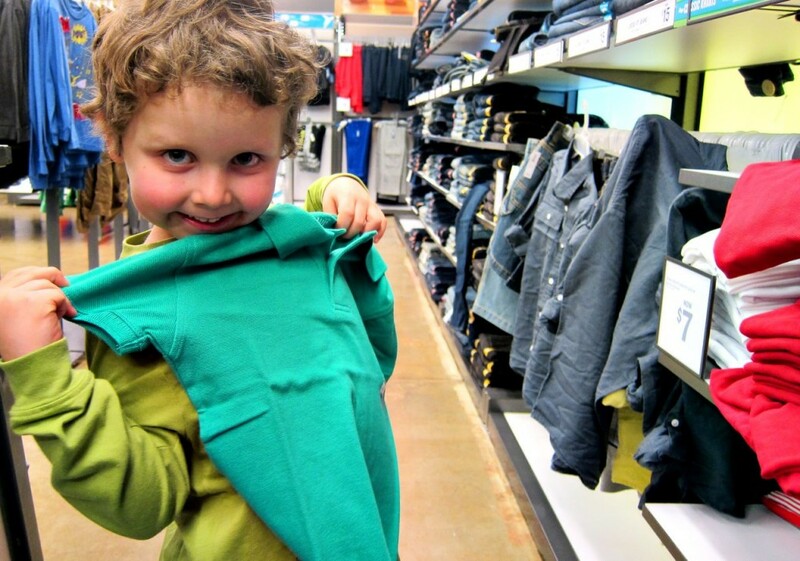 It’s a good thing everything Old Navy sells is really cute, because he was picking up colors of shirts he liked that I wouldn’t have chosen for him. 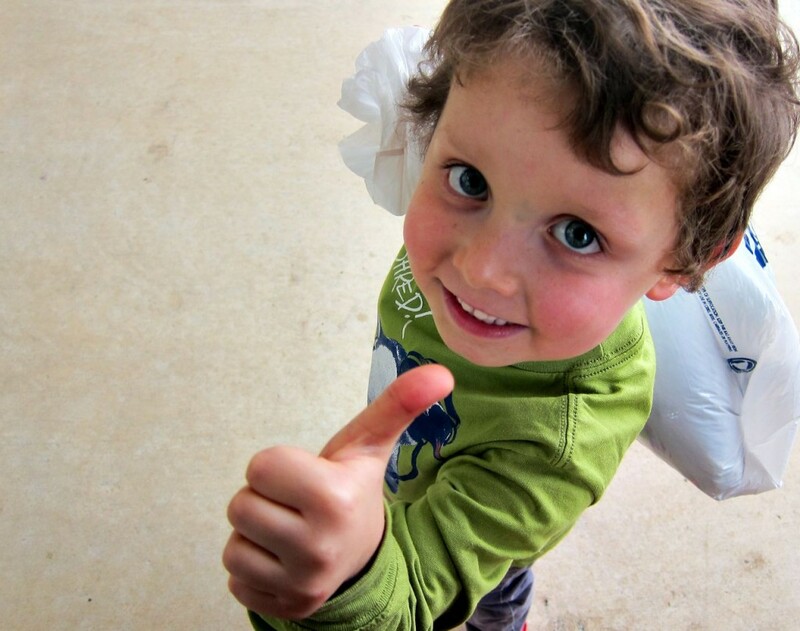 Smiley faces, beautiful clothes… and that all hits you right in the doorway! 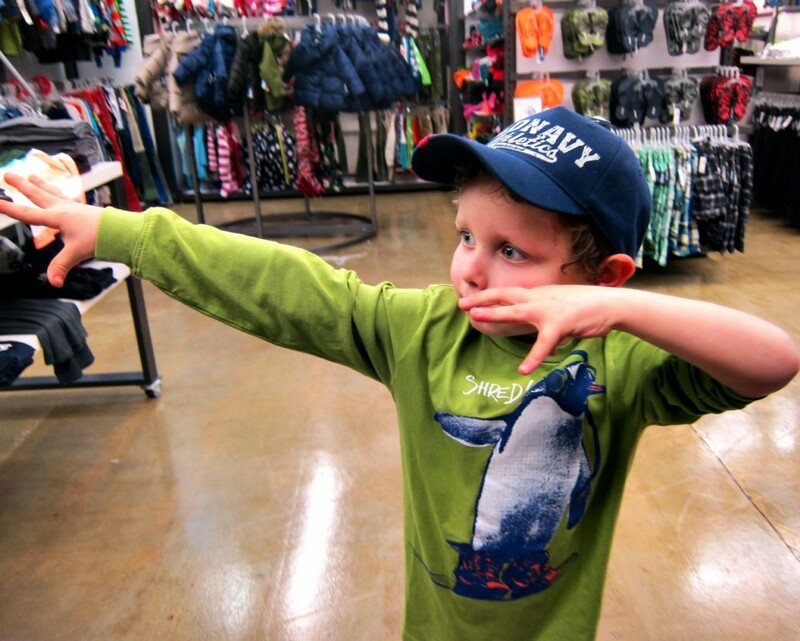 Since we both have our favorite local Old Navy layout’s memorized, we went straight to Caleb’s size area. 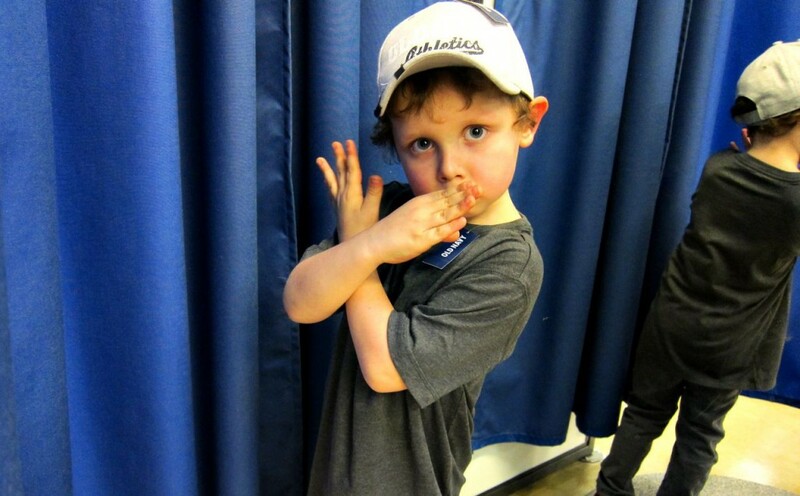 After we ooohed and awwwed over everything in the boys section, he tried on a few things to make sure they were perfect. They were, and I got a series of Superhero poses right there with the items in the dressing room. He was so excited, and I know he felt so cool. It warmed my mama’s heart. We took our cart of his items and some things for J and headed to the girl section. 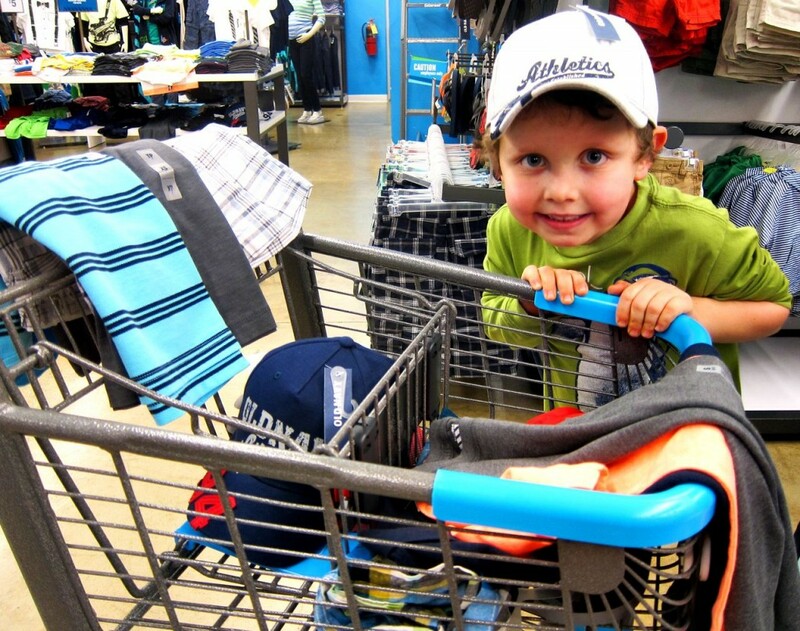 My sweet boy was so excited to pick out items for his siblings too. 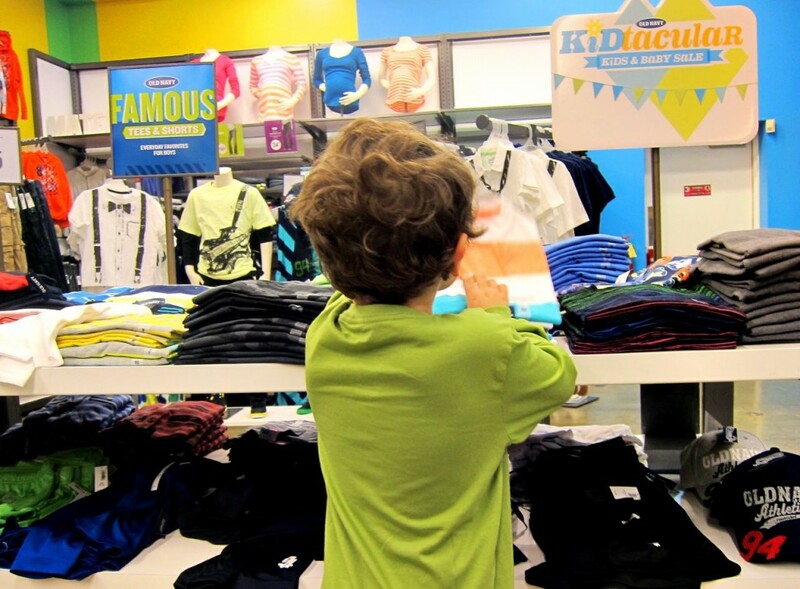 I loved watching him pick out things that he knew they would like. He struggled back and forth over the character shirts for Reagan. They had so many good ones! The final debate was between a Minnie Mouse and an Elmo and Abby shirt. Elmo and Abbie won, and Reagan is thrilled! 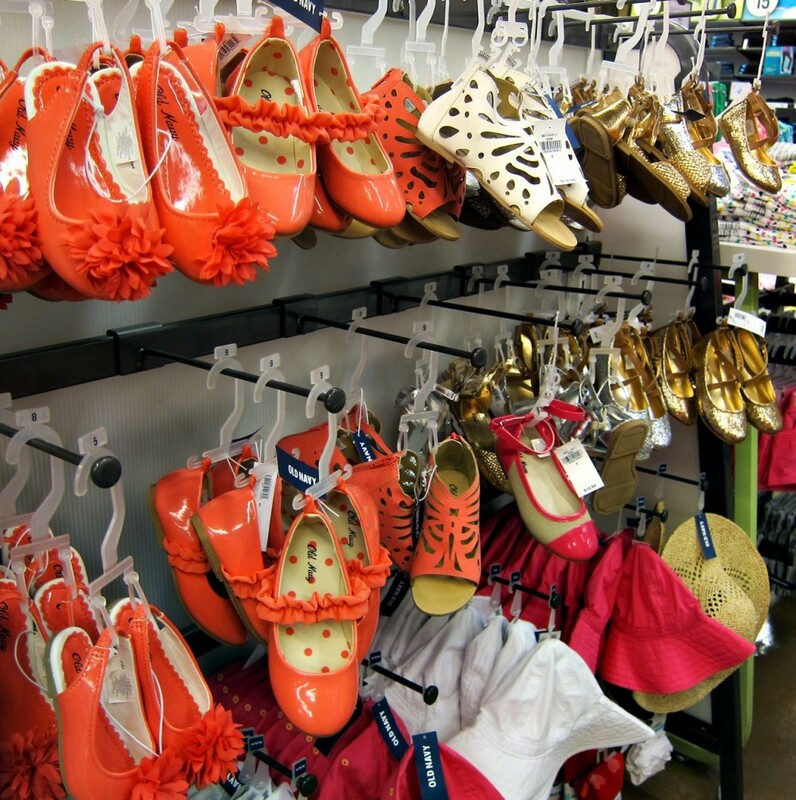 I think I could of bought a pair of each of these shoes for miss Reagan. They are sooooo cute! Old Navy has such cute accessories to complete outfits for awesome prices. I love their hair and jewelry items. The pink hair bow Reagan models later is one of my favorites! 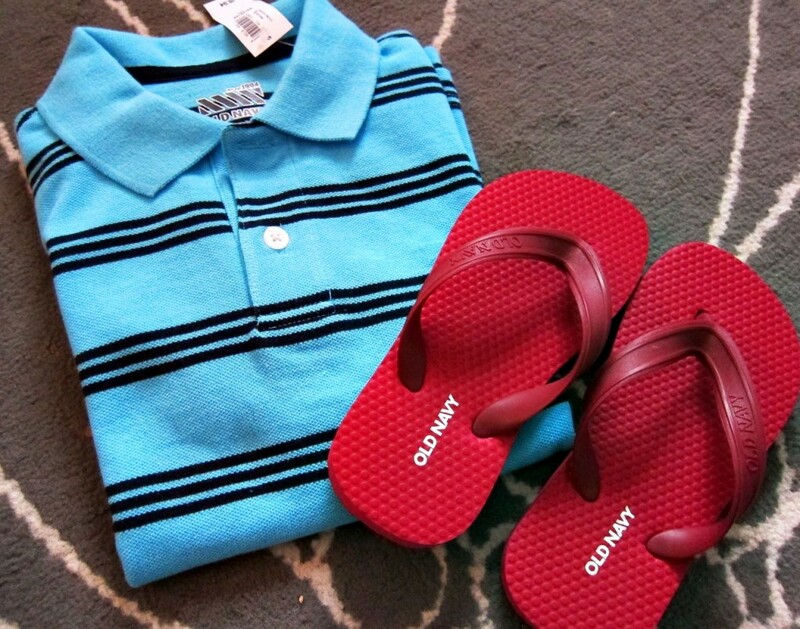 Caleb ended up getting two pairs of shorts, three shirts, a hat, and a pair of flip-flops. 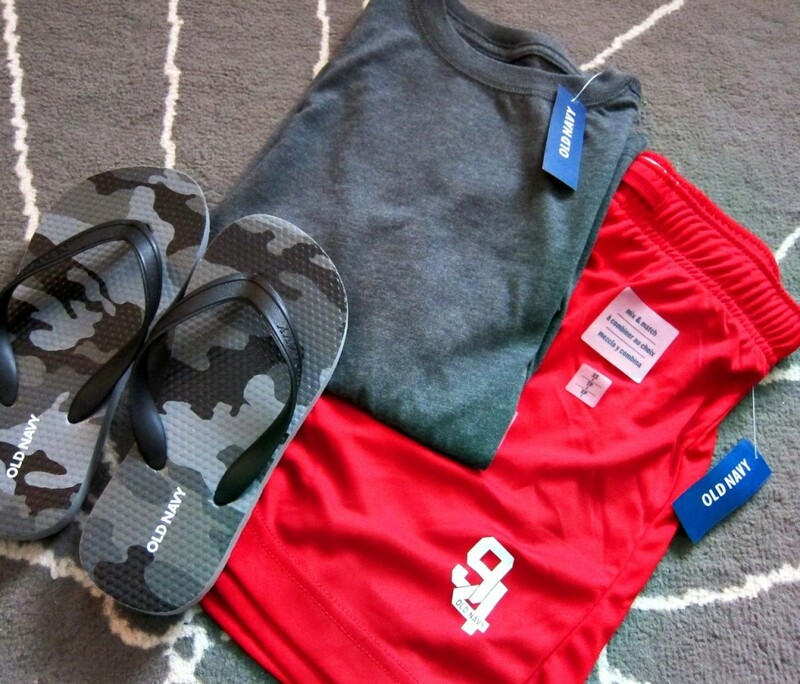 J got two shirts, a pair of shorts, a hat, and a pair of flip-flops. Reagan got two dresses and a shirt. Can you believe ALL of that was about $75!? The deals are unreal right now. You need to go check it out! 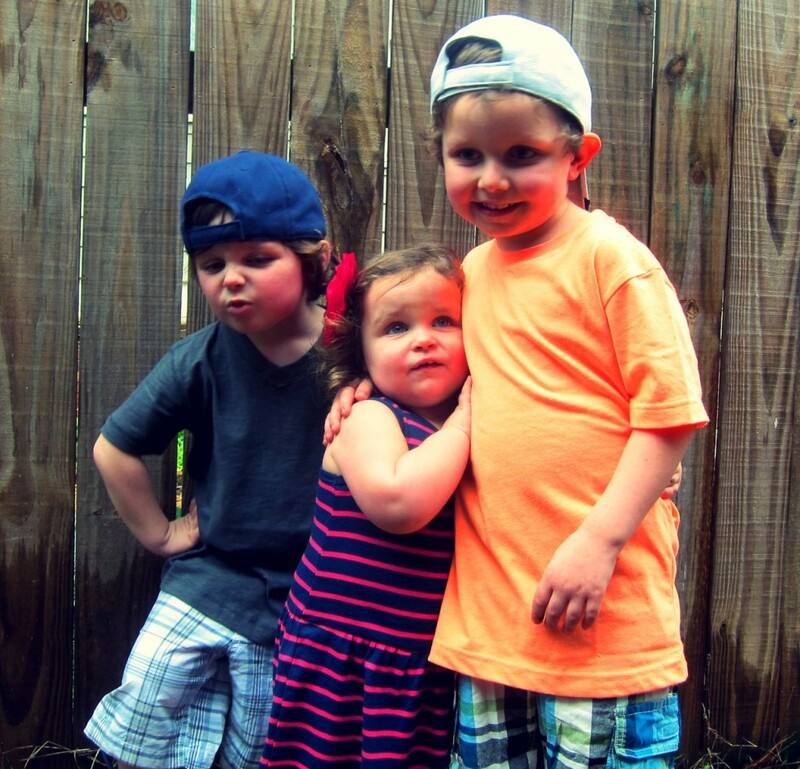 We had a great time on our shopping trip, so of course we had to come home and have a photo shoot in our new clothes. No matter that it was raining! 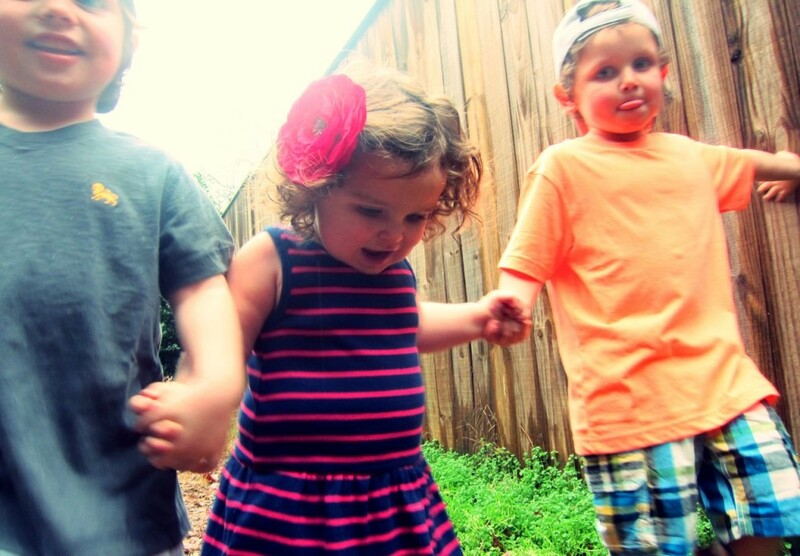 These kids have my heart and are so stinking cute. 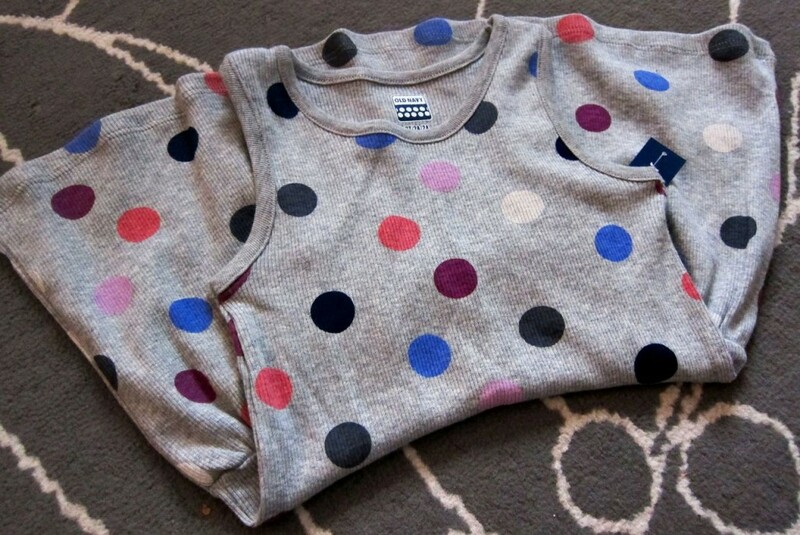 Put them in nice, clean clothes without any stains or food and it’s like over the top. Since we were already outside, we enjoyed a nice rainy walk. 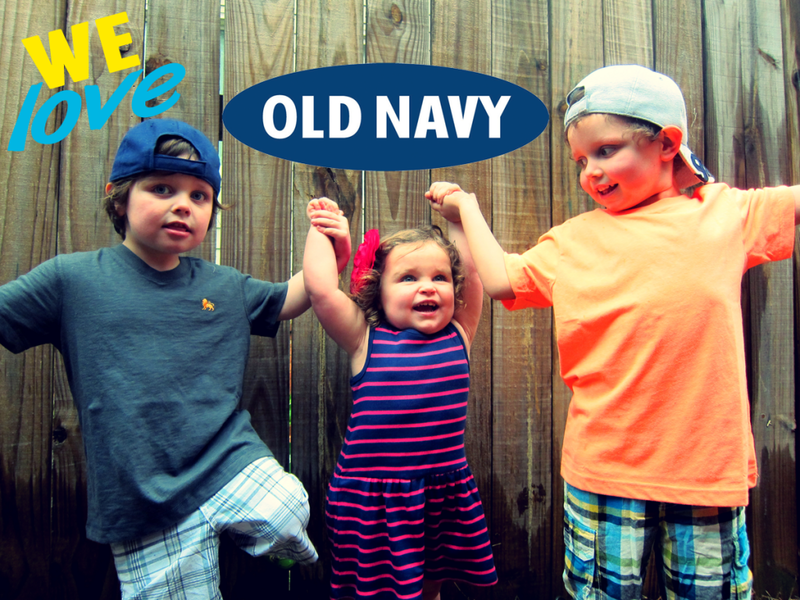 Thank you Old Navy for amazing prices year round, and this Kid and Baby Sale is just incredible! 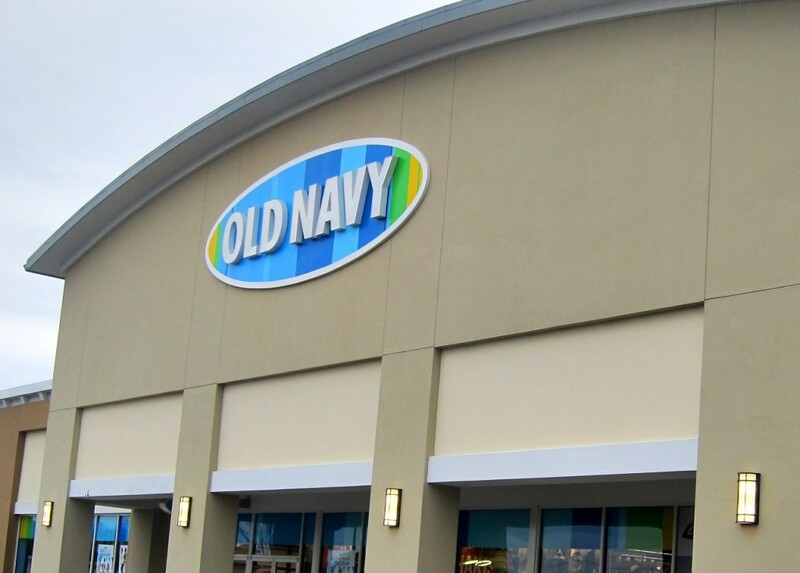 If you don’t believe me on the deals, check out your local Old Navy store or look online. You will be thankful you did! Oh my goodness….it has been awhile since I have frequented ON for the grands…and I had forgotten about their cuteness and prices. And now with the big sale, I’m off to ON today! Thanks, Erica…DARLING props for them! 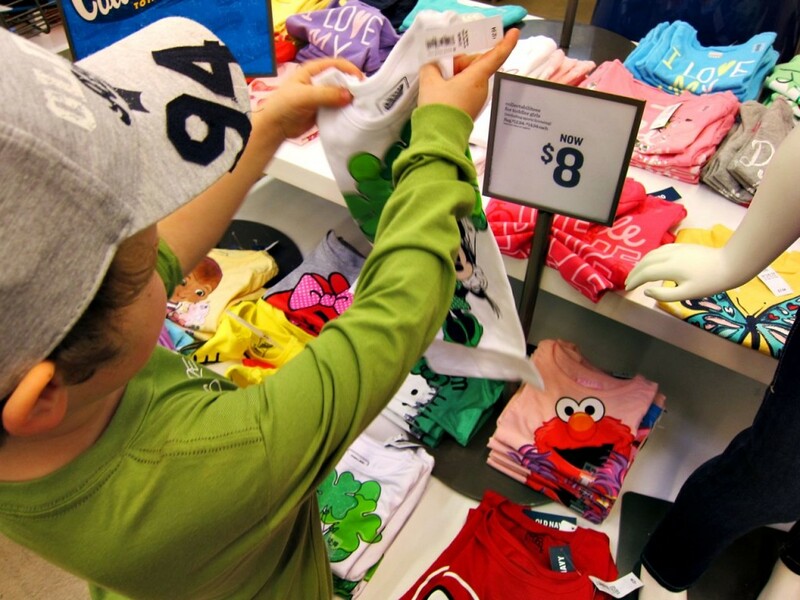 Old Navy is perfect for kids of all ages. 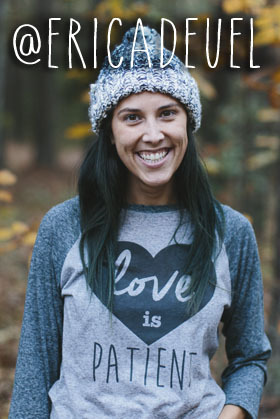 They have great basic and fun pieces plus stuff for the adults, too! 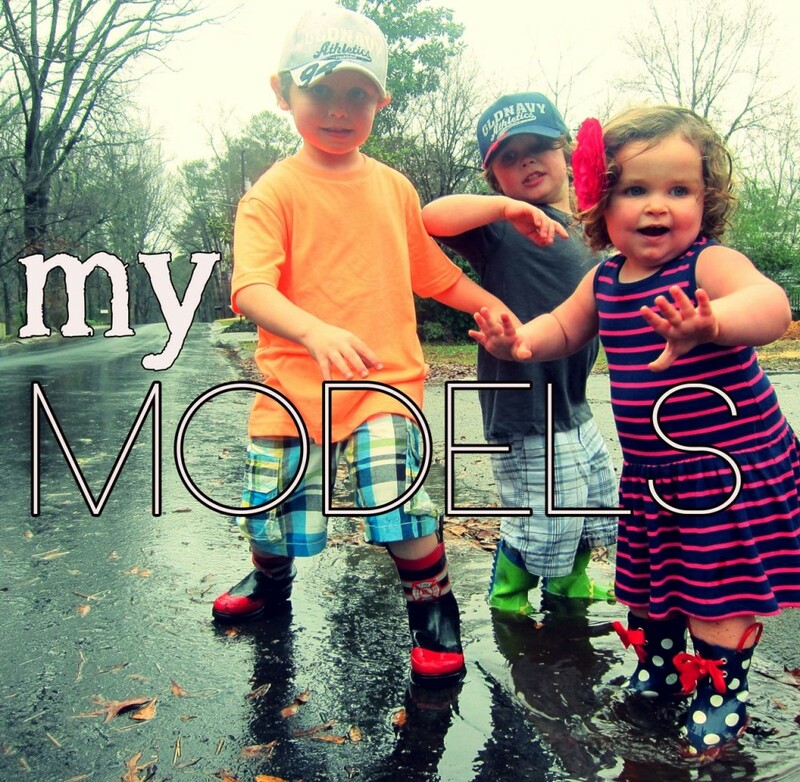 Your kids are too cute!!! 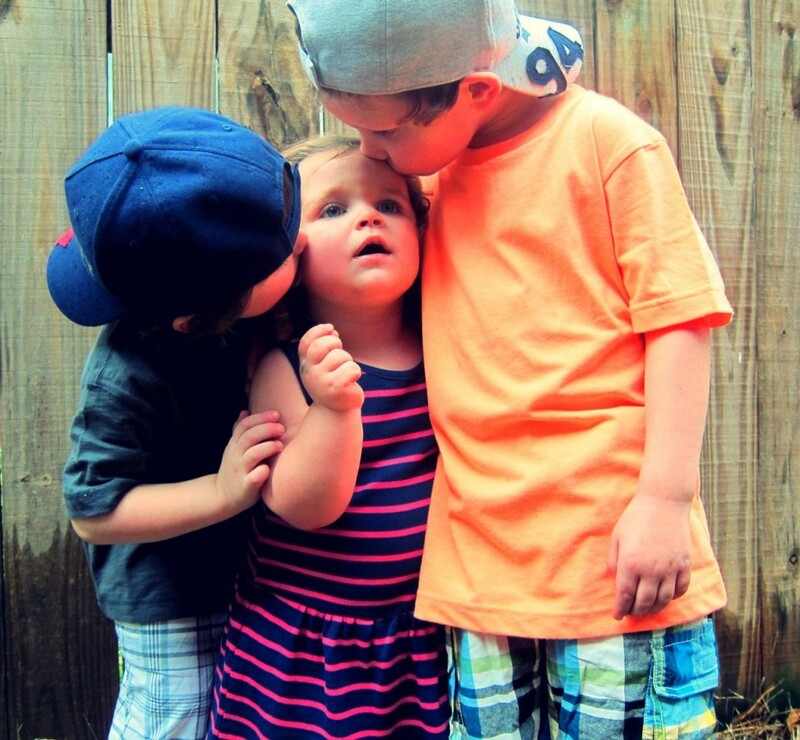 omg the boys kissing her cheeks! 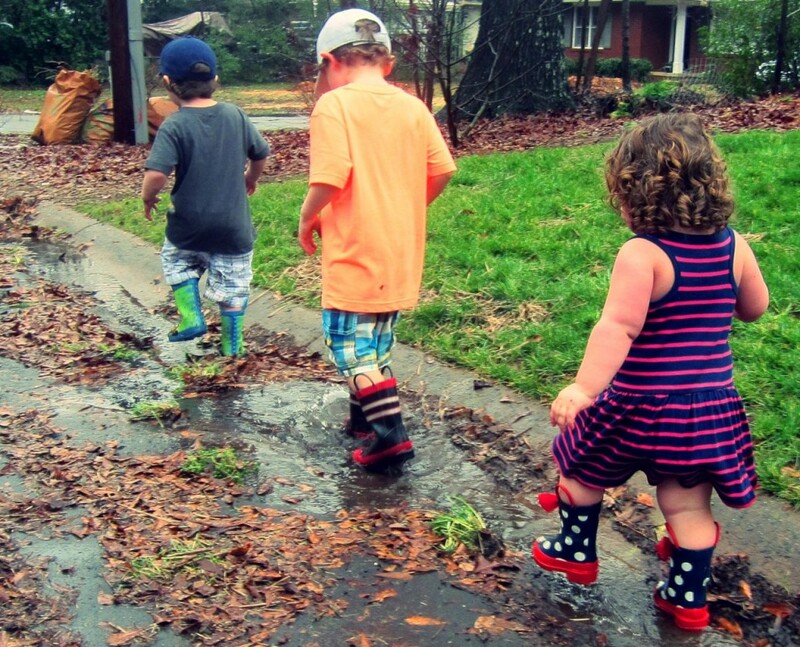 and reagan walking away with her little legs showing with the boots! adorable. looks like you had a lot of fun. 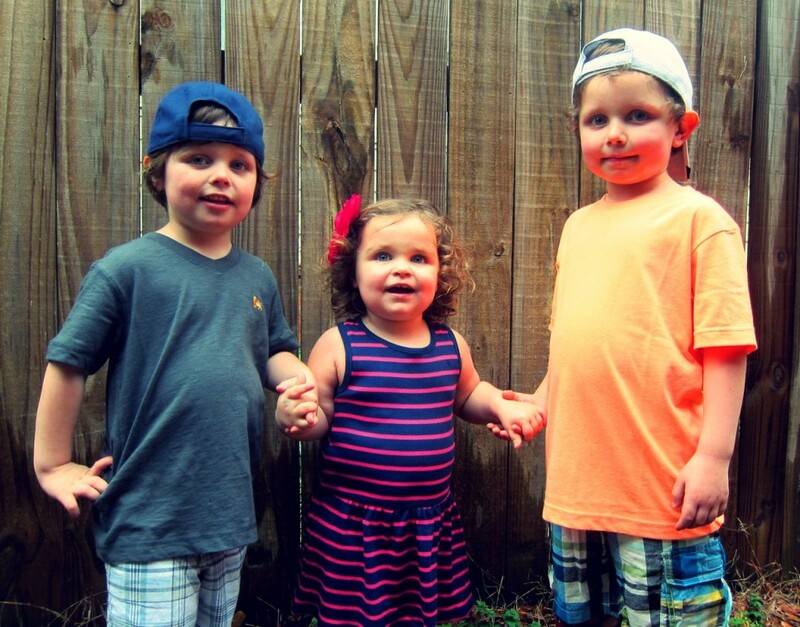 Oh my gosh they are too adorable! 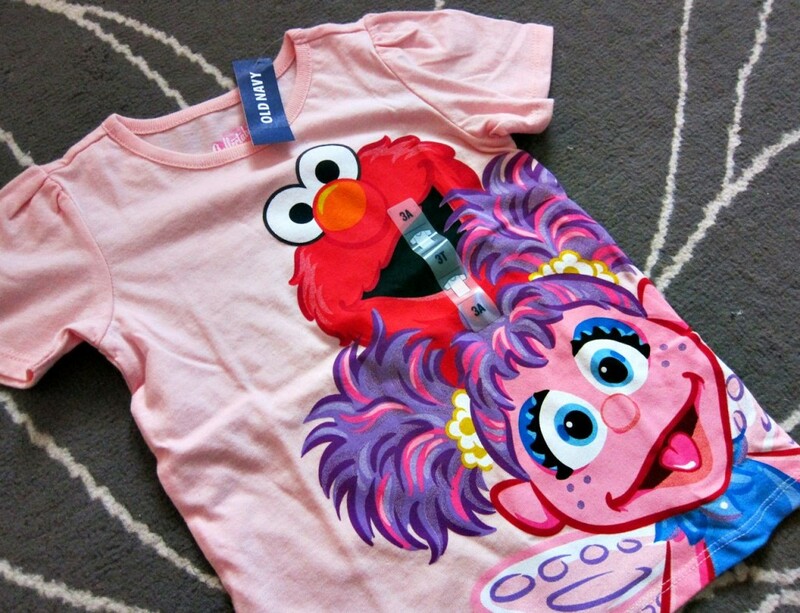 Love the Elmo and Abby shirt. We almost picked it up for our girl, but ended up with the SuperGirl tshirt with attached cape. Yazmin, ohhhhhhh How did I miss the SuperGirl shirt!?! I would have had to get that one too!! They were on hangers in my store. If you want one, you should go back, since they extended the sale!